Julie Mathilde Peelen (Tippy) from the family archive. There is the story of my great-aunt Tippy (Julie Mathilde Peelen), who was deserted by her husband in war-torn Berlin during the First World War. She had to somehow find a way to survive. As told in a family history publication : "She was left with two little children and no money. 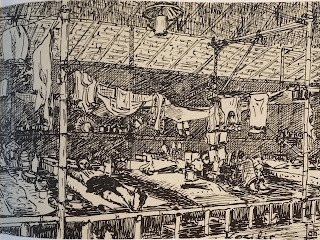 There was also hardly any food; Tip started to smoke from desperation, to not feel the hunger and so she could give the food to her children, but she became so ill that she staggered with them to a hospital in Berlin. This was overflowing with wounded officers and they had no room for her, but a young captain, offered her his room and took care of the children. They married in 1921, after she had had many operations on her stomach. " I remember aunt Tippy, she would stay on holidays with my grandfather as did our family when we returned on leave from the East. She was a kind, gracious, elegant lady, who taught me a few words of Norwegian (she lived in Oslo). When Java (Dutch East Indies), was occupied by Japan in 1942, my grandfather Rein Peelen was taken to the prison camp Kesilir, located on the very Eastern tip of Java, on 8 August 1942 (p. 36, A Wandering Tulip, the Story of Gretel Peelen by Ceris Arns). As I recall from my mother's story, the wives and mothers were allowed to visit once a month and of course my grandmother Meta Peelen-Reith packed as much food and other useful items as she could manage. She had to travel by train from their home in Salatiga (Central Java) and Google Maps shows it as a car journey of 13-16 hours, so a long day, if not two days. Kesilir is a district, not a place and was located near Banyuwangi, East Java. The cover of the book Java 1942-1945 Kampschetsen uit: Kesilir, Bajnoe Biroe, Tjikoedapateuj 15e bat. in Bandoeng, in my family archive shows its approximate location. Map showing location of Camp Kesilir on Java. Being the daughter of a customs officer, Meta knew a thing or two about smuggling. She emptied a bottle of brandy into an old Ketjap Manis (sweet soy sauce) bottle and then smeared the sauce around the opening and the cork. When questioned on arrival at the camp about the contents of the bottle she would pull of the cork and hold it up for them to smell. That's how my grandfather and his camp mates enjoyed a little clandestine brandy. Camp Kesilir was unusual. It was first established in 1926 by the Indo-Europees-Verbond (Indo-European Association) as the location of an agrarian settlement to be populated by mostly European men who had married and had children with an Indonesian woman. Poverty prevailed in the area, but Kesilir offered a reasonable standard of living. The families leased a parcel of land and were given a brief course in farming. When Japan occupied Java, soldiers were made prisoners of war and almost all civil servants were imprisoned. Unemployment was high, wages were not paid, bank funds were confiscated and thousands were left destitute. Normal life had ground to a halt. My father had also been imprisoned in Kesilir and he said it was in hindsight the best of the camps, because they could at least grow their own food and they had more space. 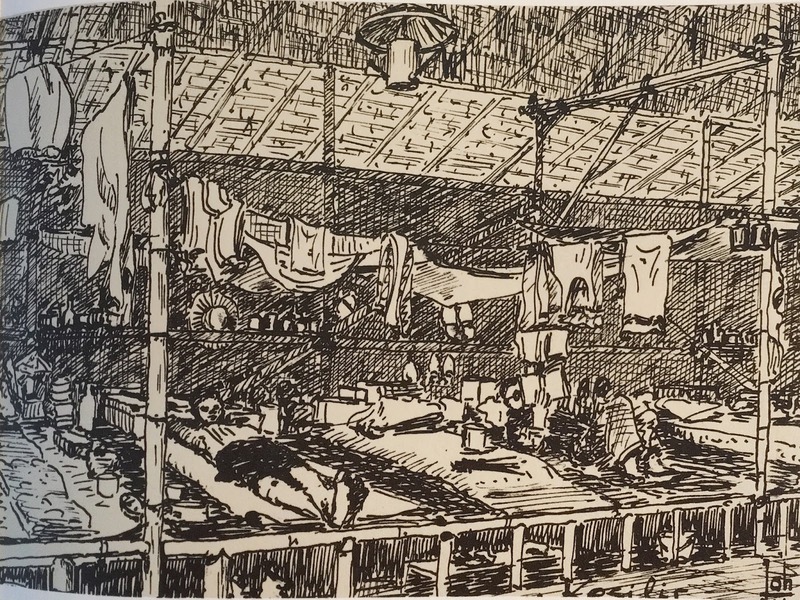 The caption for this sketch in the publication Java 1942-1945 explains that compared to Camp Banjoe Biroe, inmates had more space and more personal belongings, as well as mosquito nets. They had made the petroleum and coconut oil lamps themselves. The Japanese had banned any paper and pens. That so many sketches, portrait, notes and the like exist from this period is a testament to "where there's a will, there's a way". What family stories...thank you for sharing. Aunt Tippy's portrait is beautiful. Thank you. Indeed a treasured portrait.